Produce scholarship that inspires critical discourse, influences public debate, and shapes the future of social science and philosophy. 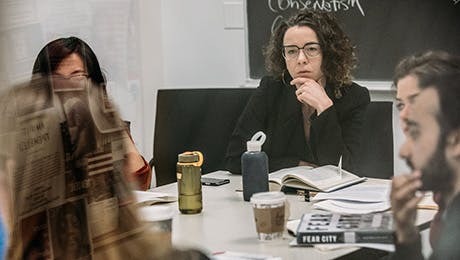 As a student, you'll take part in the New School for Social Research's long-standing tradition of producing and disseminating distinctively rigorous and engaged. Contribute to a variety of scholarly journals and interactive online platforms to further your interdisciplinary academic exploration while reaching scholars around the world, on a wide range of critical social topics. Assume an active role on an editorial staff for a publication or, author independent articles and essays-individually or in conjunction with professors. Public Seminar is an online platform reflecting the tradition of critical scholarship and public engagement of the original New School for Social Research (1919) and its University in Exile (1933). Confronting fundamental problems of the human condition and pressing problems of the day using the broad resources of social research, Public Seminar provokes critical and informed discussion through short-form posts, long-form essays, and audio and video pieces. Constellations is an international peer-reviewed quarterly committed to publishing the best in contemporary political and social theory. With roots in the Frankfurt School tradition of critical theory, it brings together a range of perspectives, including those of the Continental and Anglo-American traditions. The Graduate Faculty Philosophy Journal is a professional publication that provides contemporary authors with a forum in which to engage with the history of philosophy and its traditions. Past issues have included contributions from Hans-Georg Gadamer, Jacques Derrida, Jürgen Habermas, and Reiner Schürmann. Published twice yearly, this journal is edited and produced by advanced graduate students in the Department of Philosophy at The New School for Social Research. Launched in 2003, the New School Psychology Bulletin is a semi-annual peer-reviewed research journal created and produced by graduate students at The New School for Social Research. Articles in the bulletin cover ongoing work and collaborations at The New School, including new research, research proposals, research methods projects, and a New School historical psychology series, as well as work from the annual Graduate Faculty Poster Session. The International Journal of Politics, Culture, and Society publishes articles and reviews on issues that arise at the intersections of nations, states, civil society, and global institutions. It is concerned with the interplay of macroscopic and microscopic structures and processes, including changing configurations of ethnic groups, social classes, religions, and personal networks and the impact of new communication technologies and media on public and private life. Interdisciplinary in orientation and international in scope, the journal focuses on the connection between theory and substantive normative concerns and encourages disciplined creativity. An award-winning international quarterly of the social sciences, Social Research has been mapping the landscape of intellectual inquiry since 1934. Most issues of the journal are theme-driven, combining historical analysis, theoretical explanation, and reportage by some of the world’s leading scholars and thinkers. The New School Economic Review (NSER) is a student-run journal whose content reflects The New School’s history and traditions and embraces a multidisciplinary and heterodox approach to the social sciences, as espoused by early classical thinkers such as Smith, Ricardo, and Marx. NSER provides professors, practitioners, and students with a forum in which to debate world politics and social affairs, discuss current issues in economics, and share insights from other disciplines. Founded in 2005, the Women in Philosophy Journal (WIPJ) is published in association with the People in Support of Women in Philosophy (PSWIP) at The New School for Social Research. Edited and authored entirely by graduate students in the Department of Philosophy, WIPJ features select papers that have been workshopped in PSWIP throughout the year. In addition to its publication efforts, WIPJ, in association with PSWIP, sponsors its own colloquia at The New School.